Aviary Education is a fantastic resource for schools who want a secure, private environment for classroom collaboration on a variety of creative assignments. What makes this different from regular Aviary? All the content and sources (e.g., Myna resources or Phoenix image searches) are 100% school-safe, and teachers have classroom management (that is, they can create private student accounts and manage assignments and projects). You can always visit AviaryEducation.com to learn more! That said, our ultimate goal is to power the whole world's creativity, and Aviary Education isn't the right tool for everyone. Some teachers need specific functionality which is available to all their students for a variety of projects, but they don't need the extra bells and whistles of classroom management. In addition, older students may not have the same strict requirements regarding internet safety as younger kids. Conveniently, Google has just announced the new EDU category in their Apps Marketplace. This initiative is meant to make it extremely easy for schools and universities to discover new education-oriented web apps that integrate seamlessly with their Google Apps account. There're already thousands of universities, colleges, and K-12 schools around the world that use Google Apps in their classrooms. With the addition of an EDU category, Google is on the right track to helping people find great EDU apps while putting a big emphasis on how important education is. So (drumroll please)... We're very proud to be one of the first apps in the EDU marketplace. Aviary's editing suite for education in Google Apps will be a great addition for schools whose students use Google Apps accounts Now, we know what you're thinking: we already have Aviary Education; what's so different about the new editing suite for education in Google Apps? -More tools. Aviary Education currently allows students to use our four most popular tools - but our new suite in Google Apps provides convenient access to edit photos, markup documents, create vectors, edit audio, create photo effects, and explore colors. -You can now access these tools via Gmail (or any other Google page), through the More menu. No additional Aviary account is required, but you'll still have the peace of mind that your entire school has one-click access with their existing Google Apps account. -Built-in templates for common school projects (presentation slides, school newspaper, homework markup, yearbook pages, etc). All students need to do is open one up and customize it! These are also super helpful for familiarizing your class with layer-based editing in general, as they'll walk users through the steps needed to customize them. -Sharing through Google Docs. Any creation a user saves will show up in a folder called "Aviary Files" in their Google Docs. They'll be able to share creations with one click just like any other Google doc! Visit the Google Apps Marketplace to find more information, or go straight to our new app to give it a try! Note: Any Google Marketplace app must be installed by an administrator of your domain. This will make it available to everyone within that domain (so students can't use it until the school has installed it). Please contact us if you have any other questions about installing Aviary! launching Aviary in Google Apps Marketplace, Google asked us to create a video to help introduce Aviary to Google Apps users (many of whom are businesses). Being that this is Aviary and that instructional videos can often be boring we wanted to make a really creative and fun introduction video that also showcased stylistically what our tools can do (in addition to the more obvious functional use for a business user). 1) Show off a single use case for Aviary that would appeal to a broad set of small business owners. 2) Use Aviary's editors (and the concepts in the different editors) as the multimedia components in the story. For example, audio would be mixed in Aviary's online audio editor when possible. Items used in the scenes would be floating panels showing the editors in action or stylistically borrowing from the editors. We decided to go with the story of "Joe." Joe would be described as a small business owner who typically calls on his designer Jane when he has a design need. In this particular story, Joe needs a template design for a presentation he is giving and Jane is unavailable. No worries, he logs into Google Apps and uses Aviary to make a kickass presentation all by himself. Pretty soon we had a white-board of the different scenes and panels up telling this story. At this point, we added Meowza and Mike Peutz to the mix. Meowza's role was to create the individual art elements and Mike's role was to animate the art and create the video itself. Mike immediately got to work creating a prototype video that helped us to track our storyboard concept against an actual timeline. One thing we weren't certain about was how Joe should look. Although we wanted the background elements to be multimedia like and drawn, we thought that Joe might look better as a real person. After seeing a couple of Meowza's mockups of Joe, we decided that Joe himself should also have this kind of multi-layer feel to him, as if he was composed of elements cut out of a magazine. And as per usual, Meowza nailed it. Meowza also went to work creating some styles for different components in Joe's office. Joe's clock was based on Raven's vector editor. And coolest of all, Joe's office plant was based on the Node interface we use in Peacock, the filter editor. When possible, Mike would animate items in the video according to how the image editor would work. So when showing off how many clients Joe had, we showed the mouse clicking off additional layers. During the scene where Joe is panicking, we used a number of peacock blackbox filters on Joe's face to help showcase his emotions. The images that Meowza made did not stray too far from the storyboard. This can be seen in this comparison of the vacation scene from the storyboard and the final video. We were even able to sneak in our audio editor, using it both for the audio sequence of Jane's phone and voicemail, but also for the underlying track that looped throughout the video. By the time the video was complete it came in pretty long and needed some heavy editing, mostly in the areas where we showed Aviary's tools in action. We also had to make an audio change. Here's the first draft. It came in at 2:17 minutes. After some back and forth dialogue on how to clean it up to make it more streamlined, we were able to whittle it down to 1:40 minutes and felt it was ready enough for primetime. Here you can see Meowza and Mike's completed work. Knowing that this was turned around in under a week and was produced internally by a couple of people on our team is simply awesome. It makes me really proud to work with folks that are so talented. I'm definitely looking forward to the next time! Aviary is in Google Apps! If you use Google Apps for Domains or Google Apps for Enterprise, you can now add Aviary to your apps account (for all users) effective immediately. It will then appear right in Google's universal navigation bar. Note: Aviary can only be added by the domain administrator, so please make sure to tell whomever is in charge of your organization. To add Aviary to your Google Apps account, click the button below! The awesomely fun YouTube video! The Aviary team made this fun video to introduce Aviary to Google Apps users and help celebrate the launch. Awesome job to everyone involved, especially Meowza and Mpeutz! The awesomely fun press release! NEW YORK (Mar. 9, 2010) – Aviary today announced its suite of design apps is now available in the Google Apps Marketplace™, Google's recently launched online storefront for Google Apps™ products and services. Aviary is a feature-rich web application suite that allows users to edit and create images, vectors and audio files from anywhere in the world with just a browser and an internet connection. Now with native integration with Google Apps™, Aviary allows any Google Apps™ user to edit images and audio for marketing materials, take product screenshots for websites, create logos, and more. "Aviary is committed to bringing the power of cloud computing to anyone with any multimedia design needs, so integrating with Google Apps was a logical choice for us," says Avi Muchnick, company CEO. "By adding Aviary to the Google Apps Marketplace, we've made it extremely easy for Google Apps customers to access a powerful multimedia design web application suite that works seamlessly with their existing document collaboration platform using OpenID." 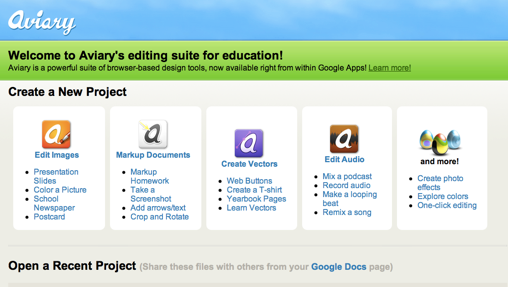 "We are very happy to have Aviary in the Google Apps Marketplace," notes Scott McMullan, Partner Lead for Google Apps. "Through the Google Apps Marketplace, software vendors like Aviary are helping us build a rich ecosystem of integrated apps that seamlessly work with and extend Google Apps to meet more business needs. The ability to edit images and audio directly from Google Docs is the kind of innovation we're excited to see coming from our developer community." Aviary, Inc makes seven lightweight, powerful design applications that can be accessed through the browser. By integrating directly with Google Apps, Aviary is extending the productivity of the Google Docs suite by adding collaborative multimedia capabilities including image editing, audio editing, color management and more. Aviary will have free introductory pricing for Enterprise users. To learn more, visit www.aviary.com/googleenterprise. The Google Apps Marketplace makes it easy for more than 2 million Google Apps customers to discover, purchase and deploy integrated business applications and related professional services. By integrating with user account and application data stored in Google Apps, these cloud applications provide a simpler user experience, increase business efficiency, and reduce administrative overhead. To learn more, visit google.com/enterprise/marketplace. Google Apps brings simple, powerful communication and collaboration tools to organizations. With Google Apps, users can use applications such as Gmail™ webmail service, Google Talk™ instant messaging service, Google Calendar™ calendaring service, Google Docs™ program, Google Sites™ web application, and Google Video™ for business on their own domain to work together more effectively. Because it is all hosted by Google, there's no hardware or software to download, install or maintain. Aviary, Inc. is a pioneer of a creative application suite in the cloud. With a suite of digital creation and editing software available as a service, Aviary offers a simple and cost-effective solution for anyone with multimedia editing needs – from graphic design to audio editing – to create and edit work right in their browser. Based in Long Island, NY, Aviary is backed by Bezos Expeditions and Spark Capital. For more information, visit www.aviary.com. Aviary is a trademark of Aviary Inc. The awesomely fun reminder to install Google Apps!